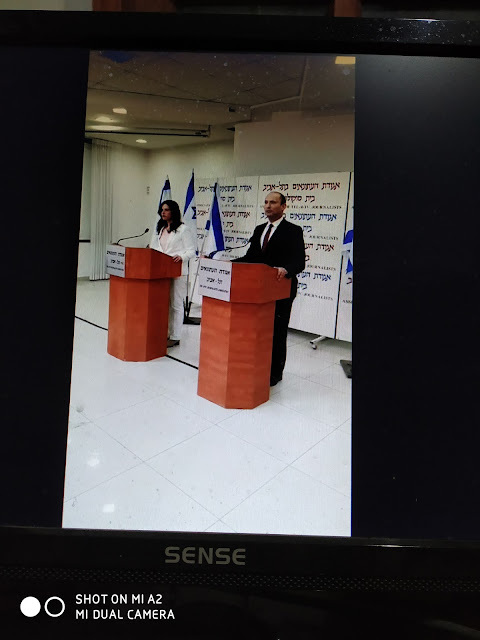 Tonight, Naftali Bennett and Ayelet Shaked announced that they were breaking away from the NRP (National Religious Party) aka Jewish Home Party and establishing a new political party that would be to the Right of the political spectrum and open to all shades of religiosity. Bennett and Shaked are calling their party the "New Right." In all honesty, I'm not surprised. I'm more surprised that they managed to stay in the rather staid NRP for five years. When Bennett told the old leadership, the ones who handle the money and property of the venerable old party, that the secular and female Ayelet Shaked was an indispensable part of his leadership package, I have no doubt that they were more shaken up than the British Royal Family when Harry made his relationship with Meghan Markle public. Just under forty years ago, the Techiya Party was established by legendary Geula Cohen and Yuval Neeman. It was a straight-talking Right party, which I supported and mourn its demise. In the 1992 elections, it didn't receive enough votes to pass the minimum threshold and ceased to exist. My guess is that the New Right is a 21st century version of Techiya, and from what Bennett and Shaked said at the press conference tonight, they would be happy adopting something I heard Geula Cohen say at a Parlour Meeting in Bayit Vegan, Jerusalem. "Is Techiya a religious party?" "Techiya isn't a religious party; it's a Jewish party." I have never liked religion as a criteria for politics and government. We have to work together.